I had been trawling the internet looking for a farm-style holiday destination where we could be immersed in nature and spend some quality time together as a family. 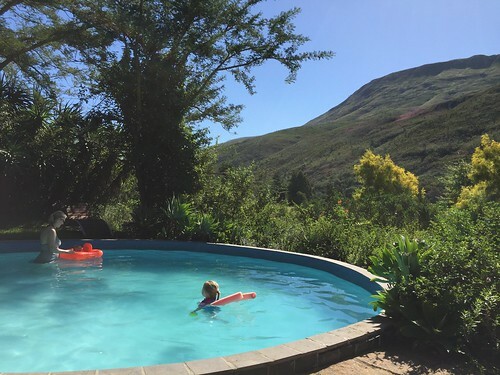 I struggled to find one that ticked all the boxes but eventually stumbled upon Frog Mountain Getaway in Swellendam. We booked up and had high expectations. When we turned off the main road onto an 8km dirt road, surrounded by mountains, beautiful cows munching on the livid green grass that seemed to cover every square inch as far as the eye could see, I knew we had come to the right place. We soon discovered our expectations would be exceeded. 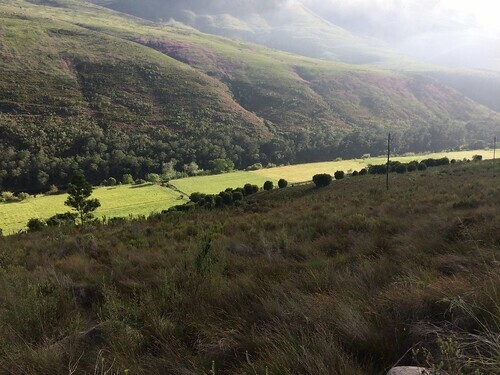 Frog Mountain sits in a valley bordered by beautiful mountains covered in purple/pink heather (heide in Afrikaans). Interestingly, heather’s scientific name is Calluna, which in Greek means ‘to beautify or to sweep clean’. Allow me the sentimentality to say that sitting on the rondawel’s stoep at Frog Mountain with the sound of the frogs, crickets and birds in surround sound and the purple covered mountain as your view, indeed has the restorative effect of leaving you feeling ‘swept clean’. I am reminded of a Lucas Maree song in which he uses the phrase ‘my siel oop knoop’ (to untie your soul). Well, come to Frog Mountain and experience this unburdening magic for yourself. Every evening at dusk when you light the fire for the braai it is beautiful to watch the flocks of white Cattle Egret (Bosluisvoel) settle in the trees along the banks of the Buffeljags river, ready for nightfall. This ritual is shortly followed by the melodic click clicking of the frogs who seem to sing in a choir all night long. I don’t often have time alone as a mother so I seized the opportunity one morning at 6:30am to walk up the hill to the labyrinth (about a 20 minute walk from the rondawel). The view from up there is stunning and so peaceful. Labyrinths are supposedly walked for personal, psychological and spiritual transformation so what’s not to like! Frog Mountain is a guest farm, as opposed to a working farm, and is owned by the Kilpin family. There are plenty of cows on the farm, two very tame donkeys and the managers, Sonja and Anthony, are in the process of acquiring some chickens as well. It strikes a fantastic balance between being an unspoilt nature retreat, yet providing all the necessary comforts without being too commercialised. There are no televisions in the properties (although there is one in the communal reception area for guests to use if really necessary) and there is very little internet or phone reception. In today’s day and age this might sound unnerving to some but I would wholeheartedly encourage you to go ‘off the grid’ in this way. Our daughter is three and a half and for the first couple of days I could see she still struggled with the habit of ‘needing to be entertained’, which can be a by-product of busy city living. However, on day three nature had worked its magic on her. She asked my husband at one point if they could just sit outside quietly and listen to all the different sounds. She collected sticks, picked wild flowers, discovered insects and walked with bare feet all the time. My husband and daughter also fell asleep whilst star gazing on a blanket one evening after our braai – how magical is that. It was such a joy not having to drive anywhere, pack endless nappy bags, lug pushchairs out of cars or struggle to find parking. We could just walk out the front door and enjoy ourselves. We walked with our feet in the mud, squeeling as it squelched through our toes, swam in the Buffeljags river with an awesome foefie slide, fed the donkeys (they are adorable and so tame), tried catching some fish in the fishing dam, played endlessly in the fabulous outdoor play area, swam in the pool and walked to a magnificent waterfall only about 500m from the main swimming area in the river. The waterfall has a fairly large, deep pool at the bottom, perfect for swimming in the mineral rich mountain water. Pack a picnic and you can easily spend the afternoon there. Birders will find plenty of viewing on the farm including birds such as the brown hooded kingfisher and the fish eagle. 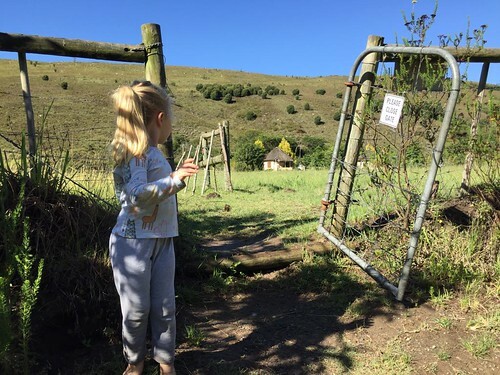 There are various hikes in the mountains surrounding the farm for families without (or with older) children. 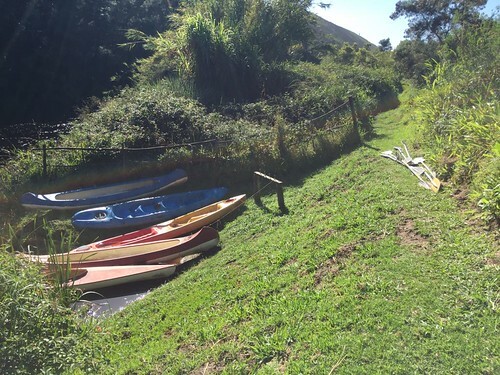 The accommodation at Frog Mountain comprises of 3 single rondawels, 1 double rondawel with two double bedrooms and a small room with two bunkbeds (sleeping four). Sam’s Place is the biggest property that can accommodate up to 12 people. We were in a single rondawel that sleeps two adults and two children. The single rondawels all have a loft space upstairs where the children’s beds are. Our daughter loved it – pretending she was Snowhite sleeping in the seven dwarfs’ house. The rondawels are rustic yet equipped with everything you need in terms of kitchen equipment, a covered outdoor braai, an indoor wood burner for colder months and enough packing space to get you settled in. We managed to fit our baby’s travel cot into our room without it feeling cluttered. Some wood is provided – I would say enough for two braais and there is a griddle (rooster). You can buy more wood on the premises if needed. If you are coming from Cape Town you will enjoy the fact that there is unlimited water use as the area has no water restrictions. We did venture into Swellendam one afternoon to stock up on supplies as the properties are self-catering. 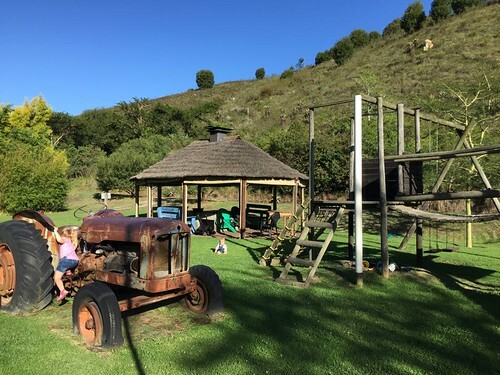 We have always just whizzed past Swellendam en route to popular summer holiday destinations on the garden route so we were pleasantly surprised by the quaintness of the town. We had a fabulous lunch at a riverside restaurant called La Belle Alliance, enjoyed an Origin coffee from Izigai coffee shop and bought fabulous homemade yoghurt made from Fleckvieh alpine cows from Seonae Eco Centre. Anthony and Sonja do a wonderful job at making you feel welcome and looked after. They are busy converting an empty building into a function venue perfect for intimate weddings etc. There is a MIDWEEK SPECIAL that runs throughout the year from Monday to Thursday – if you book two nights you get the third free. This excludes public and school holidays. April 5, 2019 Neethlingshof – a wine estate with a very special story.